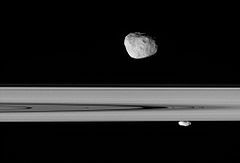 “Casini provided detail on the mass of Saturn’s moons and the physical characteristics of the rings, so mathematically speaking, we concluded that the moon Janus alone cannot keep the rings from spreading out,” said Radwan Tajeddine, a research associate in astronomy and lead author of the new research. Cassini, which crashed into Saturn Sept. 15 at the mission’s end, provided valuable data and detailed images of the planet’s rings. The A ring looks similar to a vinyl record; it has “density waves” that resemble a record’s grooves that are created by what astronomers call moon resonances. These resonance markers enabled scientists to deduce that the moons’ gravitational influence help to slow and reduce the spreading ring’s momentum. What works one way works the other in balancing. We might as well say Saturn’s A ring helps keep the 7 moons aligned and stops them dispersing and hitting each other. Both comments are trivially true and meaningless. A number of features in Saturn’s rings are related to resonances with Mimas. Mimas is responsible for clearing the material from the Cassini Division, the gap between Saturn’s two widest rings, the A Ring and B Ring. Particles in the Huygens Gap at the inner edge of the Cassini division are in a 2:1 resonance with Mimas. They orbit twice for each orbit of Mimas. The repeated pulls by Mimas on the Cassini division particles, always in the same direction in space, force them into new orbits outside the gap. The boundary between the C and B ring is in a 3:1 resonance with Mimas. Mimas is also in a 2:1 mean-motion resonance with the larger moon Tethys, and in a 2:3 resonance with the outer F Ring shepherd moonlet, Pandora. @ angech My thoughts also.The title is misleading–as though there was some intelligence inherent in the moons. Really, I don’t think they truly know what keeps them all in the observed orbits. They just know the waves have some important relationship. The ‘shepherd moon’ concept is well known. Wiki refers to ‘interior and exterior shepherds’. Some say the ‘strange “twisted” deformations’ that are observed are Birkeland currents, or are caused by them. I don’t think there is a typical solar system or set up of planets, moons rings, belts etc. It is all the process of matter derived from previous sun explosions conglomerating and the different and varied effects that evolve. Yes there will be a physical explanation that they are all in balance, how else could they be there for so long but as to the particular flukes of composition, size, stability, rotation makes us seem more part of a SIM costruct a universe game than anything else.